One of the nicest advantages of row covers is that they can shelter and protect the plants, but still let sunshine and rain through. 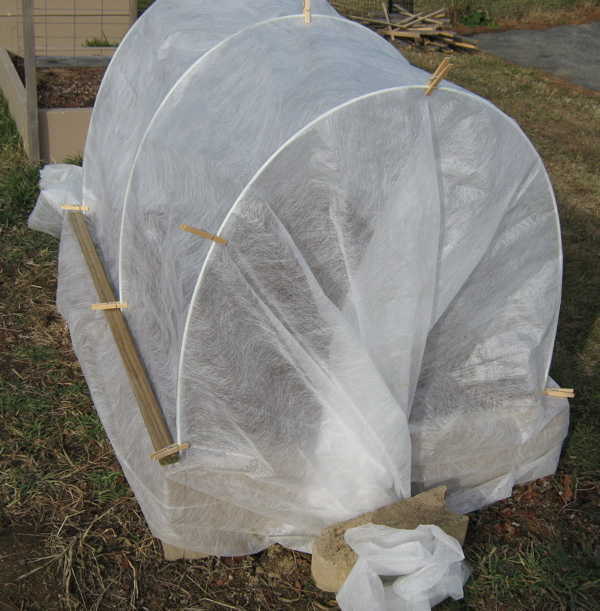 During cold and cool weather, the fabric is self-venting enough that I don't need to worry about overheating the plants on sunny days – unlike when I cover the plants with clear plastic, cold frames, or hoop tunnels. 1) Very lightweight – Provides good insect and animal control without overheating your garden plants in warm weather. Offers very little frost protection. Usually lets about 90% of sunlight through, and only lasts 1-2 seasons. I love to use this material to protect my cabbages and broccoli from getting cabbage worms. Light weight row cover can rest directly on most growing plants. Some plants, such as peppers, have growing tips that are damaged by the weight of the fabric, so you should use some type of hoops to support the row cover above those plants. 2) Medium weight – Provides 2-4 degrees of frost protection. Gives plants a warmer environment to grow in during cool weather; protected crops may mature up to 10 days earlier than unprotected plants. May badly overheat and damage plants if left on during hot weather. Usually lets about 85% of sunlight through. May last 2-3 seasons, if handled carefully and stored out of sunlight when not in use. 3) Heavy weight – Provides up to 6 degrees of frost protection. Best used to protect cold-weather plants during winter weather. Can support a few inches of light snow. Only lets 50-70% of sunlight through, so not suitable for actively growing plants. Can last several seasons. Row covers are produced by different manufacturers, and their quality can vary quite a bit. To get higher-quality row covers that will last longer, I buy mine from companies that supply market gardeners and small farmers. When you are using row covers for frost protection, try to keep the fabric from touching most of the plant leaves – leaves touching the freezing fabric are often frost damaged. You can create hoops from a number of items, including #9 wire, 1/2″ PVC pipe, or resin-coated fiberglass rods. My personal favorite are resin-coated fiberglass rods. They are very flexible, yet sturdy, and are just the right size for clothespins to securely grip. If they get flattened by a very heavy snow-load, they will bounce right back. High winds can sometimes blow the fabric off your bed, so be sure to secure it well. I use a different method if I want to secure heavy row cover for blustery winter weather. I screw thin strips of wood to firmly secure row cover to the sides of the raised beds, and I twist the extra fabric at both ends of the bed, and weigh them down with heavy blocks. 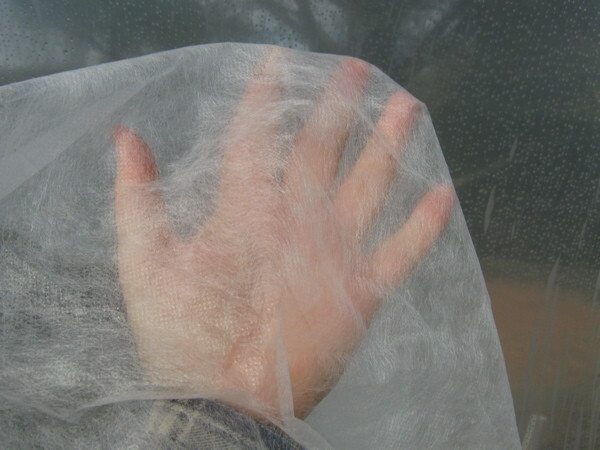 This prevents cold wind from blowing through gaps or actually blowing the fabric away. It also gives enough support for light snow. I wouldn't expect this to support a heavy snow load. I use this mostly for taller winter crops like broccoli, leeks, or full-grown kale. 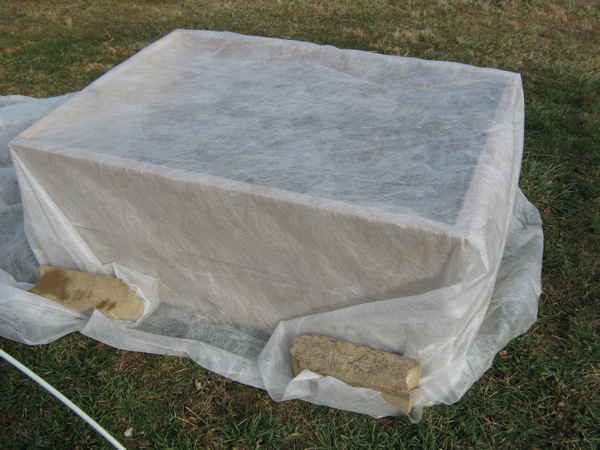 Gardeners with colder winters than I have can often protect their crops with sheets of plastic for several weeks without worrying about overheating their winter plants. Most of my winters have frequent sunny warmer days where I would have to open up or vent the plastic to not risk roasting my winter crops. Row covers are more practical for me to use. For small plants in late fall and early spring, you can skip using hoops and just stretch the row cover over the sides of a cold frame and weigh it down with blocks. For the best winter protection of small crops, see Using Cold Frames. One of my gardening students lived in a very small apartment with a tiny garden space. She didn't have room to store cold frames or their covers during warmer weather. I suggested she use mini hoop tunnels instead, as she could fold up the covers when not needed, and she could store the rods and covers in a small space.